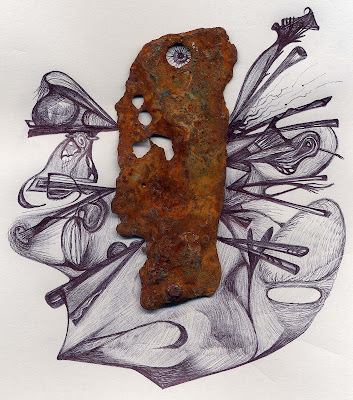 Found piece of corroded metal (from Brighton beach) and biro drawing. Abstract created 15/3/07. There won't be any new Elbowroom for at least a week. Back soon. nice find. I like the direction you've taken this, very effective. is it part of a series of found media pieces? I seem to remember one earlier with a slice of tree bark. No specific direction, I just from time to time pick up some bit of promising detritus, and it sits around until I think of something to do with it. To me, an art-potent gem, to Rachel, more a bit of old tat cluttering up the place. I probably get it from my Mum, though she doesn't art-ify and blog her bits of driftwood. I'm thinking a nice rubbing of this piece could be achieved with a few different colour crayons. I forgot to mention, it puts in mind a head on easter island. Oh John, this is absolutely beautiful. The balance is just perfect. Mmmmm. I love what you've done with this rusty piece! this is great! you are really good at combining outside elements into your work! Ian, I thought Easter Island too - I was tempted to clone it and make a colony of them. Rubbing things is a good surrealist ploy - thinking esp. Max Ernst. 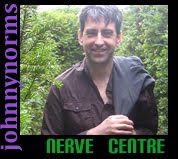 Thankyou Jo, Dave, Caroline, and Andrea - it feels loved! Now, how do I affix a lump of rusty tin to a piece of paper?! Shelly, I've filled out a directory request. I'm not viewed enough to avoid getting buried in these directories though!